The basic characteristics of radios limit their range. Under ideal conditions the relationship between effective signal power and distance is not linear; the effective signal power diminishes as the square of distance. 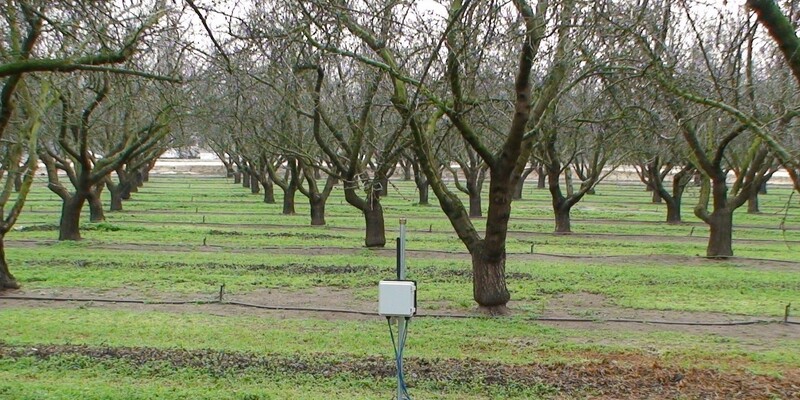 This ideal range is further compromised by radio signals being reflected off the ground or being blocked by hilly terrain or the thick canopy of an orchard. Repeater nodes link remote sensor nodes positioned beyond normal radio range with the AquaMon base station. The link is made over a 900 MHz wireless network. The repeater node accepts commands intended for the remote sensor node from the base station. Those commands are then relayed forward to the remote sensor node. Likewise; data from the remote sensor node destined for the base station is taken in by the repeater node and relayed to the base station. The grower has great flexibility in creating a network which employs both repeater nodes and senor nodes. Each repeater node can support multiple sensor nodes. Multiple repeater nodes can also be linked to extend the network even further beyond the range of one additional radio link. The network does not limit the number of nodes or the number of repeaters that can be employed. The chart above illustrates a typical wireless network which includes repeater nodes to extend network range. The base station communicates directly with the sensor nodes and repeater node within radio range. Nodes placed further from the base station connect through one or more repeater nodes. Each repeater creates a sub network of nodes within the larger node.